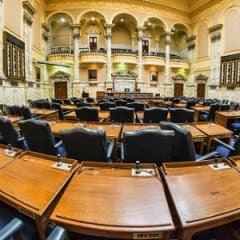 Would you make a good legislator? Take our career test to find out how you match with this and over 800 other careers. What is the workplace of a Legislator like? Legislators are members of the legislative branch of government, which is responsible for making new laws and changing existing laws. They are elected by the public to work for the federal government or for various other levels of government. They govern by proposing bills, holding votes, and passing laws. Frequent public appearances at community and social events are customary for legislators. Most legislators serve on committees that oversee different areas of government policy. They are expected to develop expertise in those areas, as well as keep up with current local, national, and international events. Most bills are proposed and developed in committees. To make informed decisions, legislators also hear testimonies from private citizens, political leaders, and interest groups. The work of legislators relies on meeting with, listening to, and forming relationships with others. They confer with and debate colleagues about the merits of proposed laws and determine their colleagues’ level of support. In doing so, they must negotiate a compromise among different interest groups and review and respond to the concerns of the people they represent or the general public. Are you suited to be a legislator? Legislators have distinct personalities. They tend to be enterprising individuals, which means they’re adventurous, ambitious, assertive, extroverted, energetic, enthusiastic, confident, and optimistic. They are dominant, persuasive, and motivational. Some of them are also artistic, meaning they’re creative, intuitive, sensitive, articulate, and expressive. Does this sound like you? Take our free career test to find out if becoming a legislator is right for you. The working conditions of legislators vary by position and level of government. Although some legislators work only a few hours a week, others work long hours and have stressful schedules. Higher-level legislators travel often and may need to live away from home while the legislature is in session. Many spend a considerable amount of time meeting with people they represent and attending social functions in addition to their scheduled work hours.